Home » Technical Libirary » Industry knowledge » What is a cold-formed sheet piling industry standard? What is a cold-formed sheet piling industry standard? (1) Standard product section appended drawing locking problem of convergence: bending steel sheet pile products locking connection is an important part of interconnected sheet piles, structure, shape and size of the mouth of the lock, steel sheet pile wall is directly related to the overall structure size, connection quality and results. In cross-sectional view of the industry standard with all kinds of cold-formed steel sheet pile products, if each of the graphics were composed by steel sheet pile wall connection nominal size requirements, found from the connection graph, outside CSPL-2 and CSPL_4 addition, eight other types of locking connection structure, there are different degrees of contact and collision in the hook area. (2) Technical data is incomplete: the main technical parameters section, only a single parameter value corresponding cold-formed steel sheet pile products, and the lack of parameters per meter pile wall width of the moment of inertia, section modulus and inertia radius. 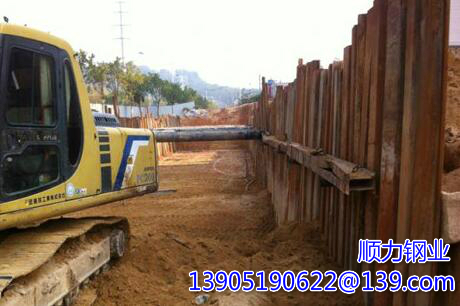 Parameter Value per meter width of the pile wall is one of the main indicators of the user selected sheet pile product need to know, especially for CSPL-2, CSPL-3, CSPL-5 and CSPL-6, as well as CSPl, CSP2, CSP3 and CSP4 and other types of products, characterized pile wall structure determines the outcome parameter values ​​per meter pile wall width parameter value is not a single steel sheet pile products simply additive. (3) Technical data did not reflect the advanced nature of products: In recent years, some foreign manufacturers of cold-formed sheet piling specialized products, in variety, size and technical specifications of indicators, there is a great development. Meanwhile, the quality factor of similar products are constantly optimized to improve, so that raw material resources are utilized to the fullest. Current industry standard size data included in the product specifications, although some reference to foreign similar products size, but did not meet the technical specifications of the parameters indicators of similar foreign products. CSPl to a thickness of 10mm product, for example, rather than similar products in the late 1960s Krupp production model K119U cold-formed steel sheet pile products. (4) technical parameters: technical parameters in the main section, a few items of data is not accurate enough, for example, inertia radius value of each product is not accurate, the actual value is greater than the values ​​listed, or even the actual value 2 times.